When I was in college, my friends and I soaked up the entire run of HBO's "Entourage." It was a television show about a group of tight friends who make it big in Hollywood, and it dissects the ups and downs of working in the movie business. Because I am so in love with the world of film, the show was right up my alley. Also, because I love a good laugh, the show was even more so up my alley. I was very glad to see the series when I did. Because I had such a connection with the show, I thought of the idea of the movie and got excited. Its so easy to get yourself hyped up for something you have a real connection to, that is what being a fan of something is all about. I don't mean to be too stereotypical here though, but any time a TV show tries for the movie treatment, its rarely interesting. 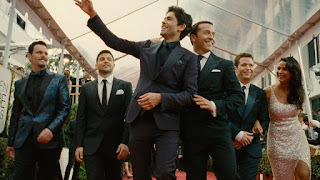 Normally for TV-shows-turned-movies, they always end up being just longer episodes of the show itself, and sadly that is all "Entourage" as movie holds up as. Adrian Grenier played actor Vincent Chase over the course of eight seasons of "Entourage." Over the course of those eight seasons, he rose to fame as an actor, as his childhood friends E (Kevin Connolly), Turtle (Jerry Ferrera), brother Johnny (Kevin Dillon) and agent Ari Gold (Jeremy Piven) helped him along the way. In the movie, Vincent Chase decides to take a big gamble in his career and takes a stab at directing and acting in the same movie. Eight months into the shoot, he needs more money, which will be hard to get because he's already fifteen million dollars over budget. Ari Gold, who is no longer an agent but now studio head, tries to get Vincent more money by swaying the financial executives (played by Billy Bob Thorton and Haley Joel Osment) to belly up. The long, wild road to get that money is the basis of the movie. If you know the show, then I already know what your thinking. Its true. This movie is an entire story worth of a season jam packed into a movie running time. This is the common ground when adapting TV shows into movies and "Entourage" doesn't even try to break that mold. We see Chase pushing himself as an artist AGAIN. We see E sorting out his confusing love life AGAIN. We see Turtle trying to score with the chick out of his league AGAIN. (This time its Ronda Rousey playing Ronda Rousey.). We see Johnny Drama try to break out of his younger brother's shadow AGAIN. We go through all of Ari's stress as a Hollywood businessman AGAIN. Its the same thing as the show, and if you loved or hated the show, those feelings will judge the movie for you. The only imaginative new direction the movie took focused on Ari and his old secretary Lloyd (Rex Lee). Lloyd is getting married to his boyfriend and he wishes Ari to give him away. Ari has to deal with being the only father figure in Lloyd's life because Lloyd lost all contact with his real father once he came out of the closet. It created a much different dynamic for Lloyd and Ari, and it was a good angle for both Lee and Piven. If only the rest of the movie tried to work different angles for our characters, then it really would have been something. The movie had its funny parts, much like the TV show. The movie is full of great cameos of actors playing themselves. It was fun on the show and its fun here too. Mark Wahlberg has a great scene. Gary Busey has a great scene. Both Liam Neeson and Ed O'Neill have great scenes. I think Ronda Rousey does okay with her material, but I don't think she comes close to being able to lead a movie on her own. "Entourage" doesn't just offer the nostalgia of the old TV Show, it leans on it like a crutch. It never comes off as anything else but condensed season of the show. The nostalgia works in some parts of the movie, I particularly loved watching the opening credit scene which was in the style of the show's opening credits, complete with the same opening song. But offering nothing new or substantial for the characters seemed like the lazy road to take, and I kind of wished it did something new or even daring. If a TV show wants to be adapted into a movie, I have no problem with that, but if the movie is only going to be a longer episode of the TV show, then whats the point? I enjoyed the show while it lasted, but if "Entourage 2" is in the pipeline, I don't know if I can muster up enough excitement to check it out. Sometimes, what makes screened media timeless is its expiration date. Sometimes, its a good idea to leave good enough alone, especially when you try it again on a different media service with absolutely nothing new to say.